Vegan Boba Tea is easy to make at home. You only need a few ingredients in order to enjoy this refreshing beverage any time you want in all your favorite flavors. So skip the tea shop and learn how to make your own bubble tea! Have you ever tried boba tea? It’s also known as bubble tea. This beverage became popular in Taiwan in the 1980s. And now you can find boba shops all over the United States as well. Usually the tea is served cold and is mixed with either fruit or milk, or sometimes both. And the bubbles or boba are the chewy tapioca balls at the bottom. It may sound complicated, but it is really easy to make this chilled beverage at home. Interested in enjoying a refreshing iced Bigelow Tea this summer season? Hover over the photo above to click through to Walmart.com and buy it! 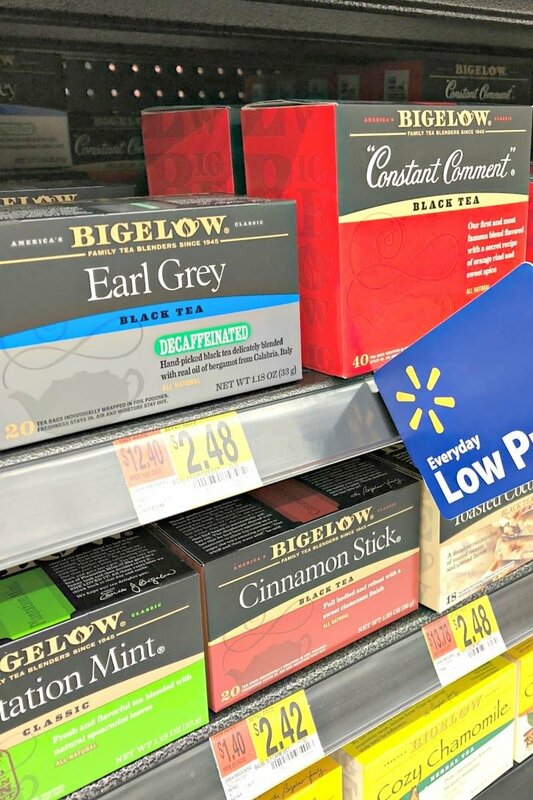 Or you can visit the store like I did and see the wide variety of Bigelow Teas that Walmart carries. You can make bubble tea with any of them! From Memorial Day through the summer, there’s nothing like a tall glass of iced tea. I particularly enjoy iced black tea, so I always buy my favorites from Bigelow including Constant Comment, English Breakfast, and Earl Grey. I usually purchase both the original versions and decaffeinated so there’s something for everyone. Did you know Constant Comment dates back to 1945? I love that Bigelow is manufactured in the United States using quality ingredients. Plus their tea stays fresh in its foil packaging. I remember my mom always kept a wide selection of Bigelow teas in our kitchen when I was growing up. And there was always a fresh pitcher of iced tea in the refrigerator. We would enjoy tall glasses of refreshing tea with lemon wedges in the back yard throughout the summer. Drinking it now brings back fond memories. And it’s perfect for serving during summer barbecue season. Now I’ve added a new family tradition to the mix by serving Vegan Boba Tea. Try it at your holiday cookout with some black bean burgers, hearts of palm salad, and blueberry crumble. I used to think making bubble tea was complicated, but then I learned how easy it is. And I love how you can make it whatever flavor you want. But even though I might add some non-dairy milk or a slice of fruit to my glass, I can still taste the delicious flavor of the tea. To make boba tea, you start with strong iced tea. 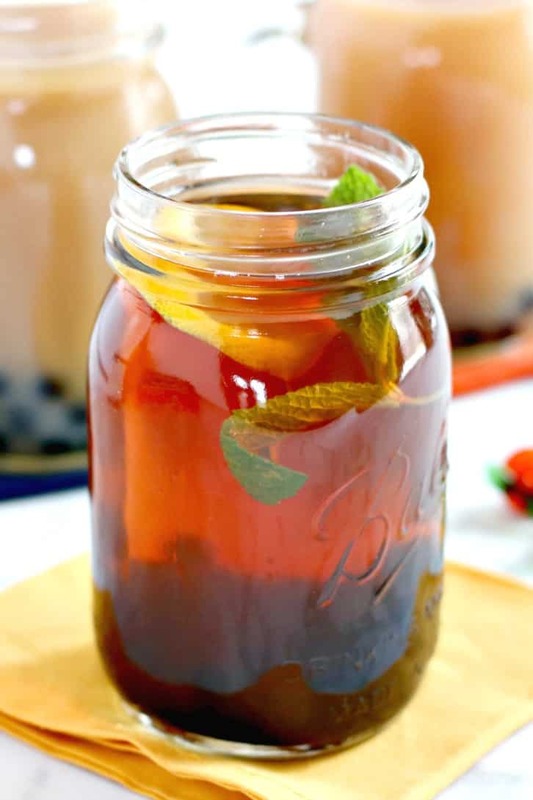 You can make the tea ahead of time if you want and keep it chilled in the refrigerator. The tapioca pearls only take about five minutes to cook. Then you let the balls cool in an ice bath, and then let them sit in a little sweetener if you like. 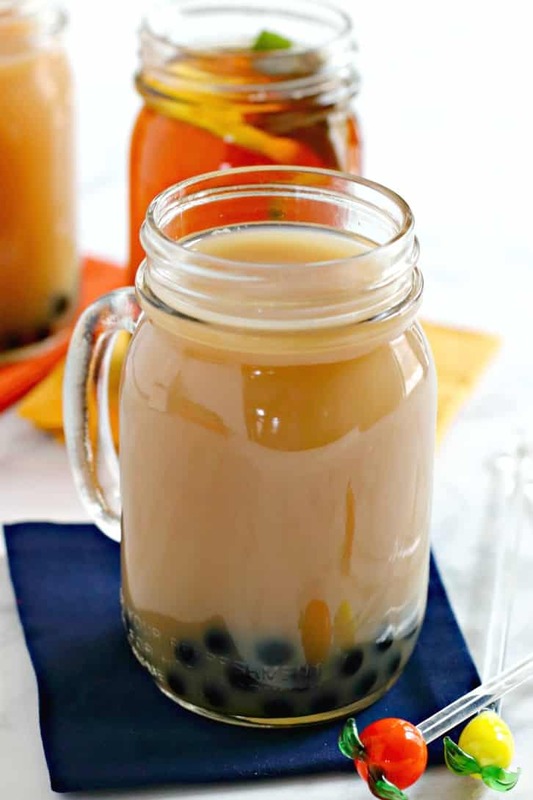 When you’re ready to enjoy a cold glass of bubble tea, simply add the balls to a glass, pour over some iced tea, then dilute it with a little cold water or non-dairy milk. The video shows how easy it is. And you can add any additions you like, such as a slice of lemon or sprig of mint. While you may be tempted to cook the entire package of boba tapioca pearls at once and store them in the refrigerator, they do start to harden after about two hours. I recommend only making what you’re going to use right away. Besides, they are so fast to cook and cool, you can always make more if you decide you want another glass of bubble tea! 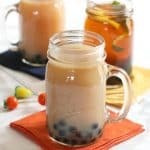 Now grab your favorite Bigelow tea and let’s make Vegan Boba Tea! 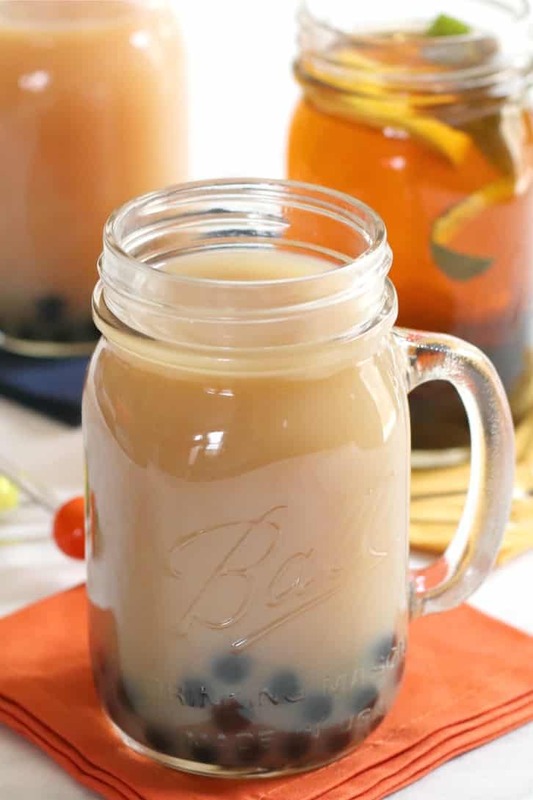 Vegan Boba Tea is easy to make at home. You only need a few ingredients in order to enjoy this refreshing beverage anytime you want in all your favorite flavors. So skip the shop and learn how to make your own bubble tea! Once the tapioca balls are cool, drain the ice water. If desired, drizzle them with agave syrup or your sweetener of choice. When the tea is chilled and the boba tapioca pearls are ready, place the boba in a 16 ounce glass. Next, add the chilled tea to the glass. Then add up to 8 ounces cold water and/or non-dairy milk until the tea is your desired strength. Add any additional ingredients you like such as a lemon slice, mint leaves, or other fruit. The tea can be brewed ahead of time and chilled in the refrigerator until ready to use. You can also make an entire pitcher of tea if you plan on making more than one serving of boba tea. The boba tapioca pearls shouldn't be cooked too far in advance because they will start to get hard after about 2 hours. It's best to make them for immediate use. Nutritional Facts do not include non-dairy milk. I’ve never had bubble tea! I’d often see bubble tea shops in LA, but I never went inside. I don’t think we have any baba places in my town now. Nice to know that I can make it at home! They are very popular in Southern California, and I think the trend is spreading to other places. I wouldn’t be surprised if a shop opens up where you live soon! Once you have Thai tea with boba it’s over! Delicious and addicting!